Via Adam Lee’s Daylight Atheism, I came across Geoff Ó Laoidhléis interesting use of word frequency analysis to uncover evidence of an astroturfed anti-abortion group. The group Pro Life Atheists claims to represent atheists opposed to legal abortion. However, Laoidhléis’ analysis suggests that the group’s constituency is not what it claims. 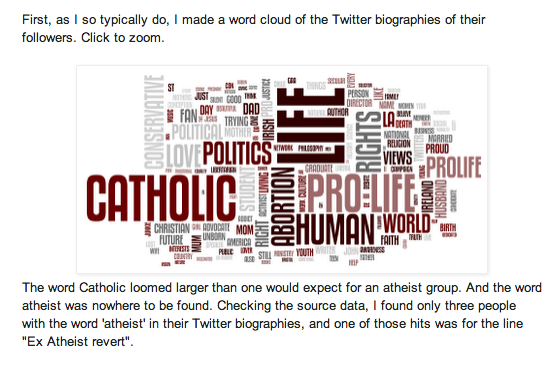 Laoidhléis looks at the @ProLifeAthiests twitter account, collecting text from the Twitter biographies of those who follow the account and generating the word frequency cloud pictured below. He reports, “I found only three people with the word ‘atheist’ in their Twitter biographies, and one of those hits was for the line ‘Ex Atheist revert’.” Laoidhléis also looked at who the followers followed, and none of the usual atheist suspects popped up among the accounts. This isn’t proof that no atheists support the Pro Life Atheists, but it does raise doubts. I’ve used similar word cloud generators in my classes to help students focus on key terms in sources they find, encouraging them to use those terms to generate keywords for further research. Frequency can be deceptive, though in this case it isn’t just low frequency but the near-absence of identifying terms that helps make Laoidhléis’ argument. In terms of classroom uses, it is useful to remind students that the prevalence of a term does not equal endorsement (the identifying terms of a subject for a polemic would stand out prominently in a word cloud) and to keep in mind that differing views may rely on the same terms that they define in conflicting ways (as I discussed in my previous post). I haven’t used word clouds to conduct audience analysis before, but after encountering this investigation it is something I’ll experiment with in the future. Two word cloud generators to use in the classroom: Wordle & IBM’s Many Eyes project (which includes several other visualizations in addition to word clouds). This entry was posted in Online Discourse, Pedagogy, Social Media, Visualization and tagged discourse analysis, pedagogy, twitter, visualization, word clouds. Bookmark the permalink.